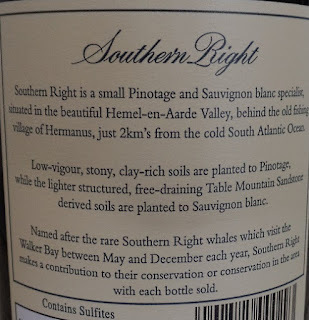 As I fly home today after three weeks of enjoying superb Cape wines, many under labels I've never seen at home and brands I'd never even heard of previously I am reminded of Anthony Hamilton-Russell's long championing of Pinotage. 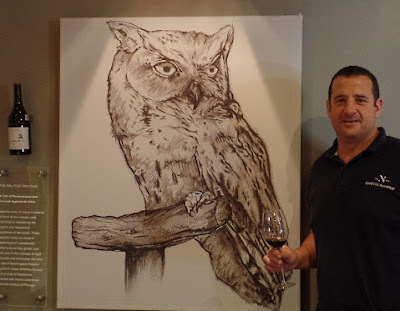 Anthony Hamilton-Russell owns Southern Right Winery, (Pinotage and Sauvignon blanc specialists), Hamilton Russell Vineyards (Pinot Noir and Chardonnay) and Ashbourne (Pinotage and Sauvignon blanc/Chardonnay). The following text comes from a PDF on the Southern Right web site. Being “uniquely” South African is not enough to make Pinotage an attractive prospect for South African exporters. 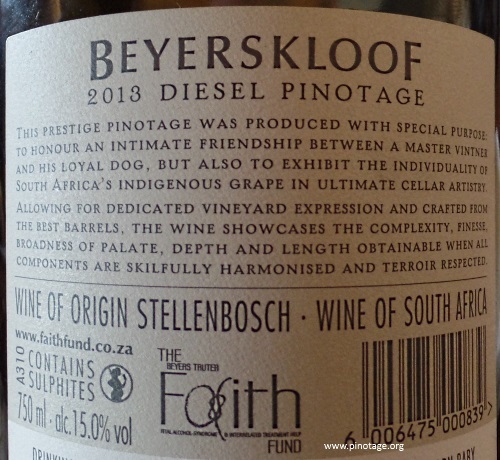 It is its South African origins combined with its ability to make great wine that make it an attractive prospect. 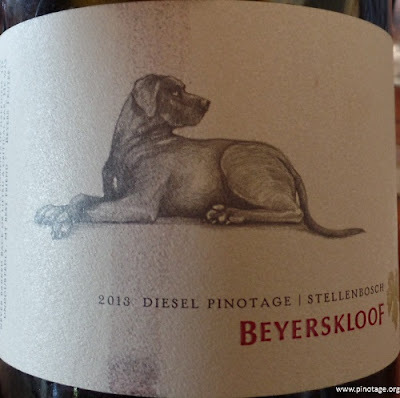 I am convinced that the intrinsic qualities of Pinotage lend themselves to the making of great, age-worthy, origin expressive wine with a uniquely South African style and personality. 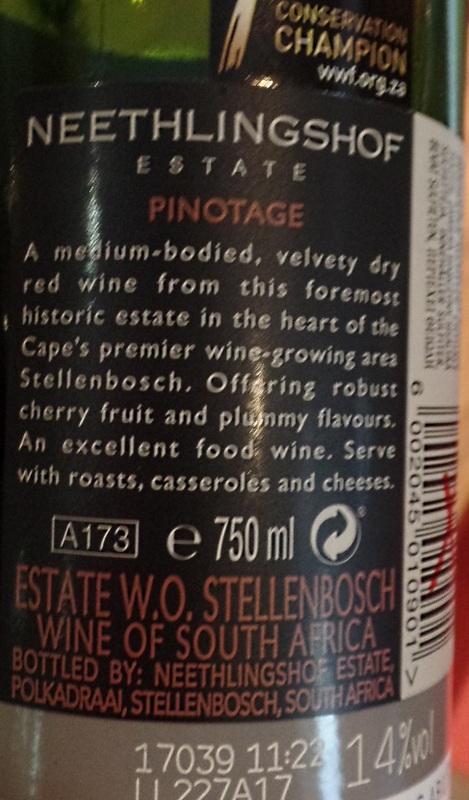 I am also convinced that one day South Africa’s most internationally famous wine will be Pinotage based. The grape should not be blamed for much of the indifferent wine made from it. Imagine judging the quality potential of Cabernet only ever tasting mid to late-1980’s South African Cabernet. 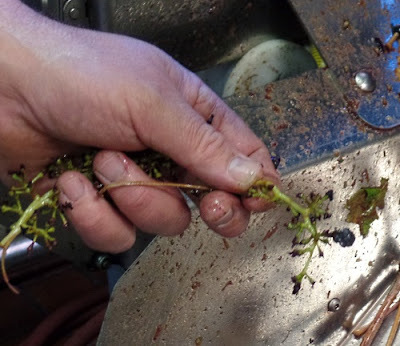 Luckily, every other variety we work with has an international benchmark somewhere to excuse the grape and point a finger at the producer or choice of site. 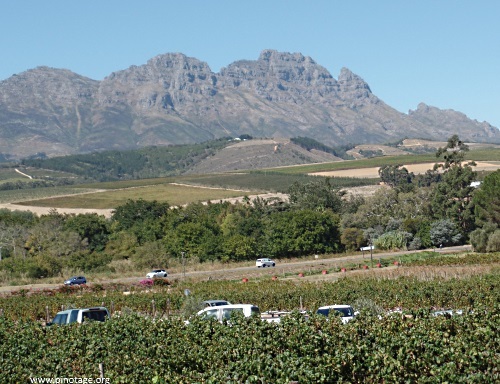 As our wine industry internationalised, South African producers went from being over-confident on shaky foundations to lacking confidence on far firmer foundations. This lack of confidence has made far too many producers avoid anything that has not been successfully done by one of our international competitors. We run the risk of entrenching a “follower” mentality in the wine industry and being an industry of imitators not innovators. If we look at the top-end of our industry we are all too often essentially making South African imitations of somebody else’s wine styles. It is quite bizarre, that in South Africa, Rhonerangers are regarded as innovative. They have not even been the first to imitate the Rhone. Pinotage is the path of most resistance to Shiraz’s path of least resistance and it requires confidence and persistence to pursue this path. No international umbrella brand has been built through the efforts of others to trade on. 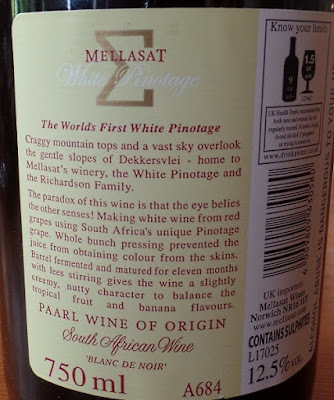 I have generally found that wine-lovers with a confident and experienced palate, really respect great Pinotage – while inexperienced palates are reluctant to like something that has not been visibly and widely liked internationally – unless of course they don’t know what they are tasting. Pinotage as a variety still caries a “ball and chain” of associations with the old South African wine industry. Many capable winemakers keen to be associated with all that is new and modern are reluctant to associate with the grape. It was a mistake to think that Pinotage could be South Africa’s signature red at all price points. I am increasingly convinced that it only really shines at the top-end, in the hands of focused boutique producers. Too few people are familiar with these wines and too many are familiar with high volume, hot climate, high yield lowend Pinotage. 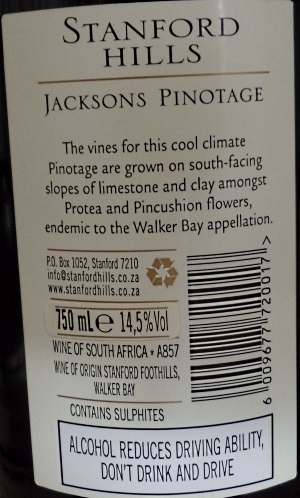 For far too many producers, Pinotage is an afterthought in a range of “international” reds. It is a difficult grape to grow and to vinify and unlike Shiraz in this country is highly site specific. It will punish a lack of physiological ripeness particularly hard (with esters and possible bitterness) and only really excels at low yields, while having a tendency to over-crop. It also does best with prolonged, expensive wood treatment. Those without focus and mental and financial commitment, will fail to excite with the variety. 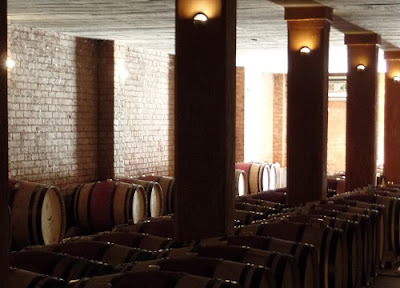 If more of our top producers, had the courage and confidence to put their backs into Pinotage (blended or otherwise) with more persistence, we would create a top-end sector of great interest to international consumers and of great value to the industry. And we would finally have a top-end category not defined by its similarity to another country’s benchmarks. Producers working towards this are the innovators in the industry. 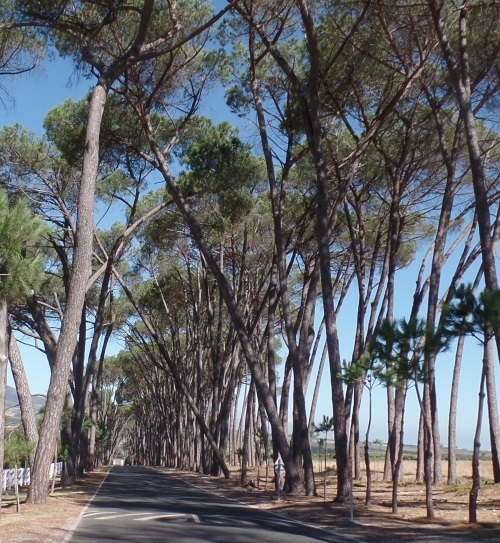 To Stellenbosch and Neethlingshof Estate. Driving along its kilometre long avenue shaded by towering stone pine trees makes a grand entrance and brings to mind horse drawn carriages making the same journey in past centuries, since the estate was founded in 1692. It takes its name from Johannes Henoch Neethling, who in 1828 became joint owner. Smartly dressed and active in the community he gained the nickname 'Lord' Neethling. As usual, we'd booked lunch on the terrace of the grand Manor House which faces the winery, with a view of vineyards stretching behind. Before lunch I meet cellar master De Wet Viljoen, whom I saw last at the IWSC awards ceremony in London in November. 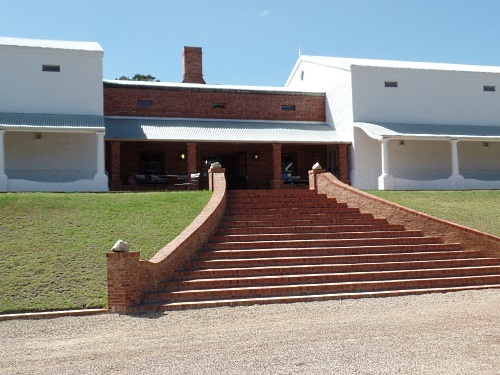 Neethlingshof produces two Pinotages, both estate grown. 'Owl Post' is a premium barrel selection from the Owl Post single vineyard that is barrel fermented and aged for 12 to 14 months. The vineyard takes its name from the posts that encourage owls to perch on in the vineyard as pest control. The standard Neethlingshof Pinotage is tank fermented then aged in barrels, about 40% are American oak and 20% are new. De Wet says that 2014 vintage was large and is ready for earlier drinking, while 2015 suffered from draught at the start which produced smaller berries and better concentration. A couple of days later I found a shop selling the previous vintage. 2015 releases a tremendous smell on opening, and it's fruit is sweetly rich and delicious. Neethlingshof 'Owl Post' Pinotage 2015 also has that Neethlingshof intensity of deep colour. It's spicy and silky with soft tannins that firm up on the finish. 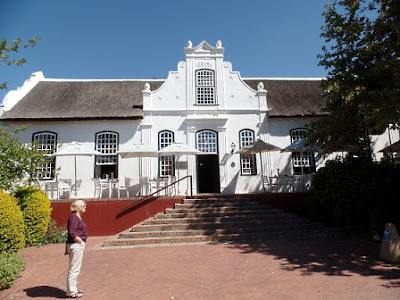 The restaurant had reworked its menu since last year and we shared a bottle of Neethlingshof Pinotage 2016 to accompany a delicious Bobotie with all the trimmings. Both a beef bobotie and lentil version are available. Opening up in the glass this quintessentially South African wine was a perfect match with the traditional South African food. 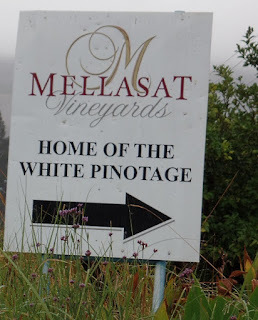 To Paarl and Mellasat Vineyards, home of the White Pinotage. Vineyards alongside Mellasat's dirt access road are exotically dotted with clumps of tall bamboo canes. Stephen Richardson, a farmer from Norfolk, England, bought the property in 1996, started planting vines and produced his first vintage in 1999. 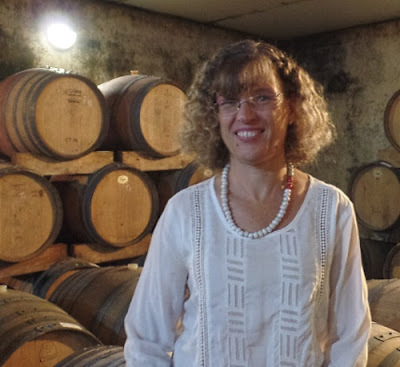 With fellow winemaker Gizelle Coetzee and two assistants, Mellasat's cellar has a maximum capacity to deal with 50 tonnes, which is roughly 45,000 bottles “although wines like the White Pinotage have a much lower yield per tonne due to the whole bunch pressing and the need to avoid any colour emanating from the last few squeezes of the press,” says Stephen. We go to the barrel cellar where this years vintage is fermenting. “The first year, 2007, we made one barrel,” says Stephen. 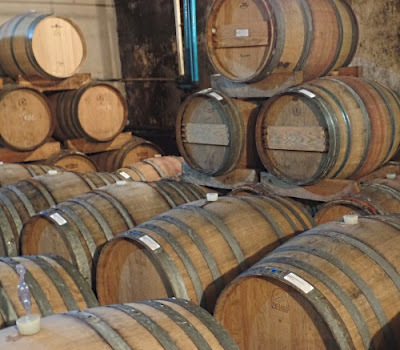 “Then four barrels and this year we've made 20 barrels, though two are reserved for a new MCC (Methode Cap Classique) methode champenoise sparkling wine, the first in South Africa. 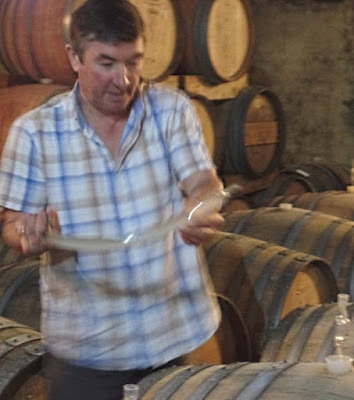 Stephen used a wine thief to extract a sample from each of the four batches in barrel. The differences in these works in progress were noticeable: the first was sharp and acidic, the second and third quite floral and the fourth more full and creamy. The first three were in old oak, the last in first fill. “We're using Romanian oak barrels as they give a spiciness,” says Stephen. 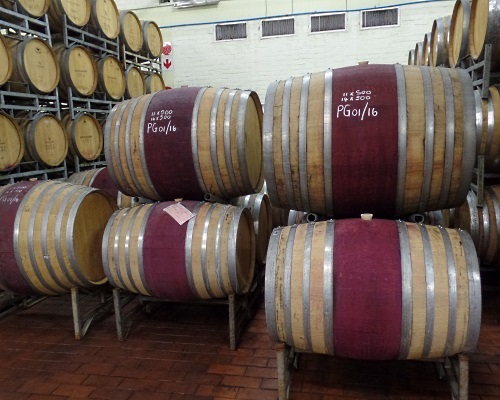 After maturation the batches are blended together to make the final White Pinotage. 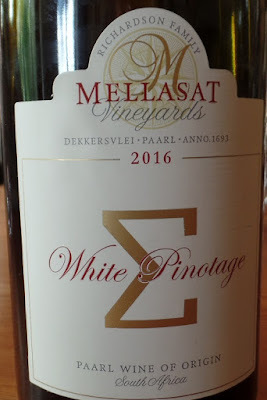 As well as White Pinotage, Mellasat grow and make Chardonnay, Viognier, Shiraz, Cabernet Sauvignon (released after 18 months in barrel and 3½ years in bottle), Tempranillo and an intriguing Cab-Shiraz-Tempranillo blend. 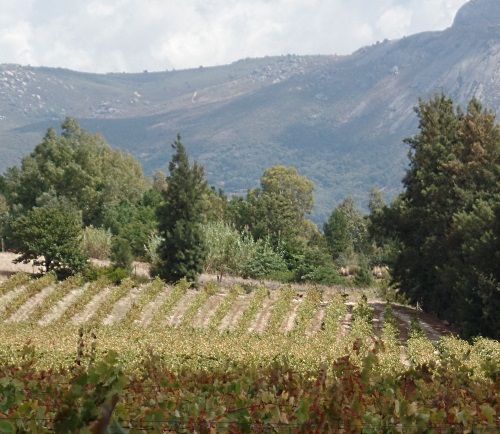 Mellasat are one of just a handful of wineries growing Tempranillo. It was planted in 2007 with the first vintage in 2011. Stephen says “I think more South African wineries should plant Tempranillo. Most goes into blends. We currently make a 100% varietal. It's a variety that suits our climate.” Stephen says he is intending to plant Graciano, a variety often blended with Tempranillo to make Spain's famous Rioja. All the Mellasat wines are now estate grown and made. 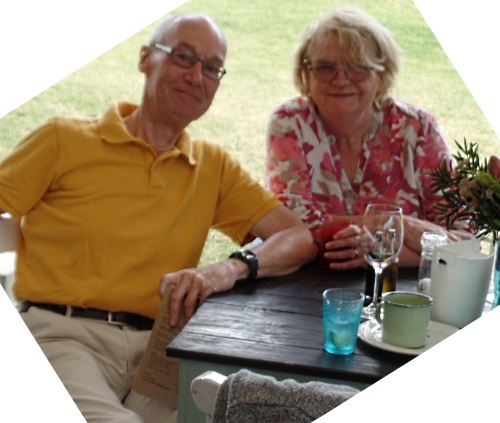 “We are now thinking of registering as an Estate,” says Stephen. In the tasting room Stephen opens his range of wines. The White Pinotage 2016 tastes fresh and inviting with great texture and subtle oak in the background. 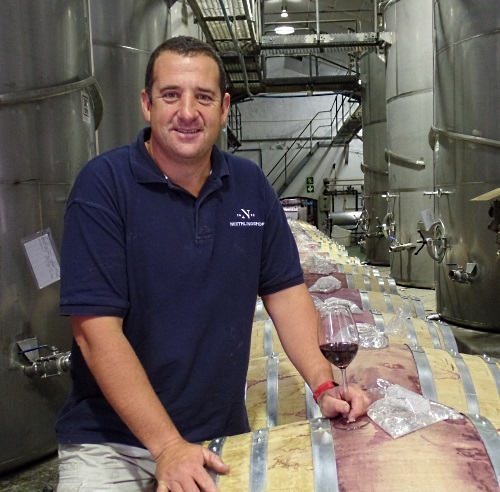 “2015 was sharper but this vintage has more fruit and mouthfeel,” says Stephen. “Lower alcohol, too, just 12½%,” adds Gizelle. 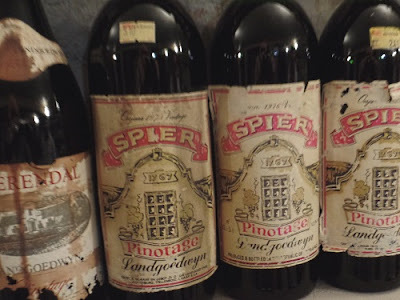 Before I go I ask to see Stephen's 'Cemetery of Forgotten Wines' and he takes me down to a cellar below the tasting room where wines for sale are aged, and the library wines are stored. On shelves around the walls are old, mostly Cape, bottles some with their original price stickers. Brands that no longer exist and historic labels abound with prices we'll never see again. It's interesting to see how much some wineries have changed their branding, while Chateau Libertas' label has hardly altered. Most bottles have been donated by friends who forgot about them and kept them too long. Also on show is one bottle of each on the White Pinotage. Originally named Enigma, because it was an enigma, a trademark issue changed the name to Sigma. white (wine) from black (grapes). To Stellenbosch and Beyerskloof for lunch at their Red Leaf Restaurant with dear friend Pierre Loubser, retired Chairman of the Pinotage Association. 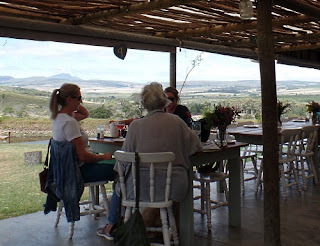 The menu has had a few tweaks and Jo was delighted with her Bobotie filled Spring Rolls with a large Chef's Salad, but I'd travelled many thousands of miles to the Cape intending to have the famed Pinotage Burger again and Pierre is also a fan, and we were not to be deterred. Burger with Pinotage onion reduction. We started with a complimentary bread from their pizza oven, a very moreish disc of the lightest crispest pizza dough generously topped with garlic and herbs. Afterwards we enjoyed coffee as there was no room left for dessert. What to drink? 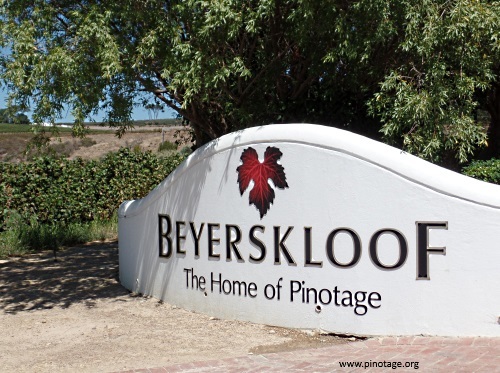 Because Beyerskloof's popular white Chenin/Pinotage had sold out they listed the excellent Simonsig Chenin from the neighbouring estate for those preferring a white wine. But I plumped for the delicious top of the range Diesel Pinotage 2013 at the cellar price of R625. This is a work of a winemaker at his peak, and even though the combination of inflation and the drastic fall in the value of sterling meant is worked out almost twice as expensive as last year, it was savoured to the very last drop, which seems to come sooner with each bottle. Poured by the knowledgeable Reggie, it was gorgeous stuff (to use a technical term :). From the restaurant one looks out over the valley to a line of mountains on the horizon. 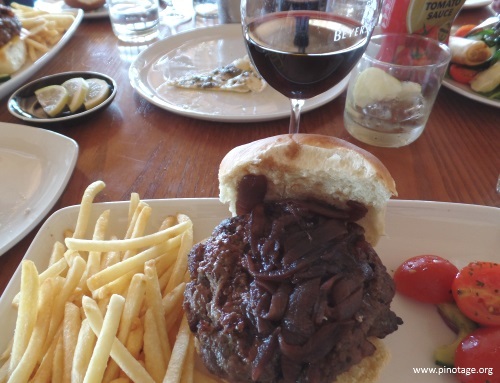 There are such wonderful views all across the Cape, and even better with a Pinotage Burger and glass or two of Pinotage. Owner Cellar Master Beyers Truter gave me a quick cellar tour. 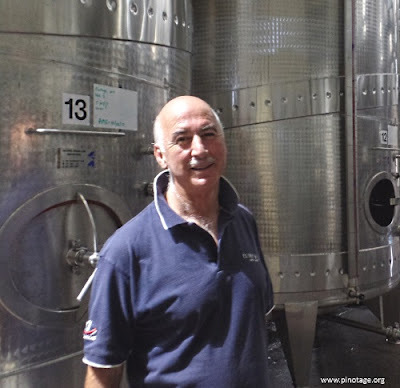 He's always bubbling over with ideas to promote his favourite cultivar: one is to do something very special by showing some non-South African Pinotages at this year's Pinotage Day, the other is to add a Pinotage Grappa to Beyerskloof's portfolio. To Hemel-en-Aarde Valley and Southern Right which specialises in just two wines, Sauvignon blanc and Pinotage. 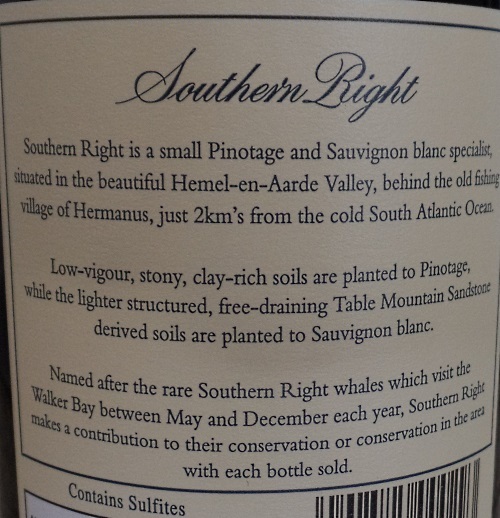 Southern Right is named after the whales that come every year to calve in the shallow warm waters of Walker Bay; every bottle sold makes a contribution to their conservation. 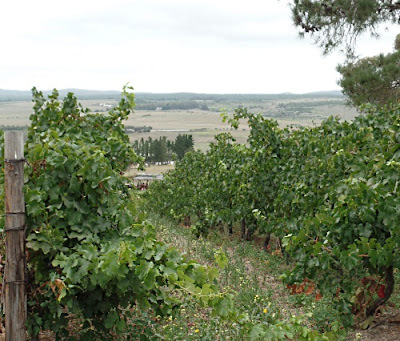 There's a small vineyard running alongside the stony track leading to the tasting room, but one trellis next to the road had large yellow fruits. “Lemons,” says Jo, but I say they are apricots or maybe peaches. Inside the tasting room the remnants of a log fire is burning. In front of it is a huge block of stone and in front of that snakes a pipe from the fermenting tanks to the right into the barrel cellar to the left. We sit outside and are served the 2016 Savvie and 2016 Pinotage. 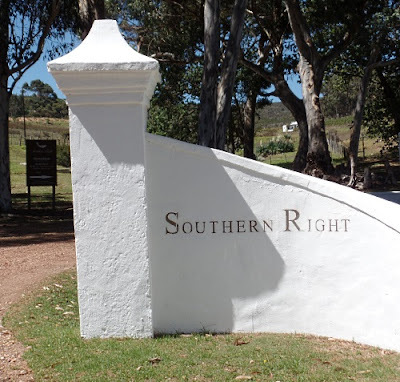 Southern Right make a cracking good Sauvignon blanc, with grassy intense flavours and a wonderfully lingering finish. 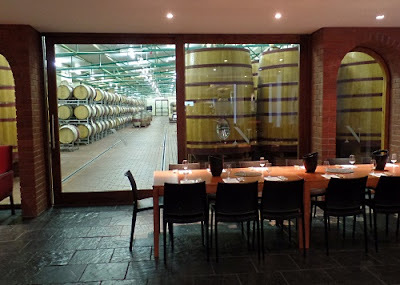 The 2016 Pinotage, which with 9½ months aging in 228 litre & 10% 400 litre French Oak Barrels surely must have just been released, is served from a decanter and is purple in the glass. It looks and tastes very young and a tad disjointed with a grapey finish. 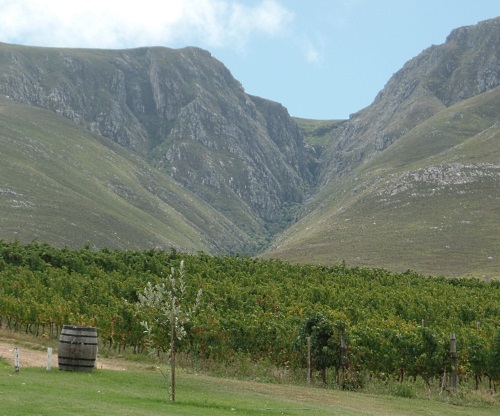 Pinotage grows on the clay rich soils on the neighbouring Hamilton-Russell estate, owners of Southern Right. 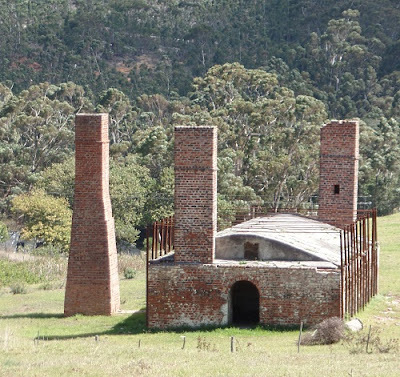 Evidence of how rich the ground is in clay is the building spouting several tall chimneys in front of the winery. This was used to make bricks here until 70 years ago. 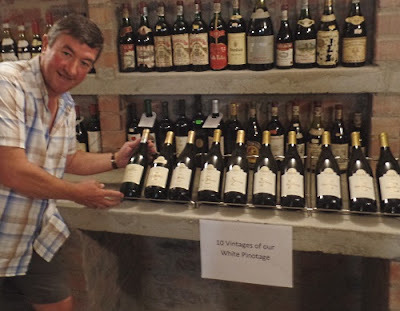 The charming and efficient lady running the tasting room tells me they have stocks of Pinotage from the 2000 vintage to date which each cost just 25R more then the current 2016. 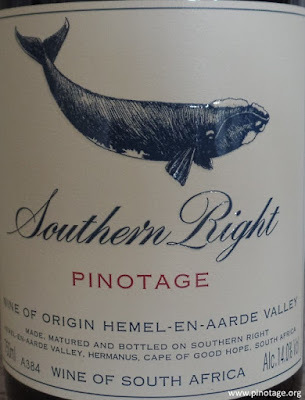 We leave with three bottles of 2016 Sauvignon blanc and one 2015 Pinotage: this has a glowing review in Platter 2017 which gave it 4.5 stars and I'd like to see what it's like. 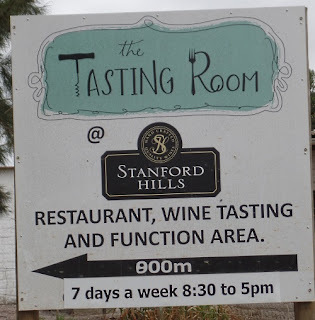 I'd enjoyed Stanford Hills' Jacksons Pinotage in the past and, according to their website, their restaurant was open daily from 08:30-17:00 so while in Stanford we headed up hill a short way from the main road to have lunch. 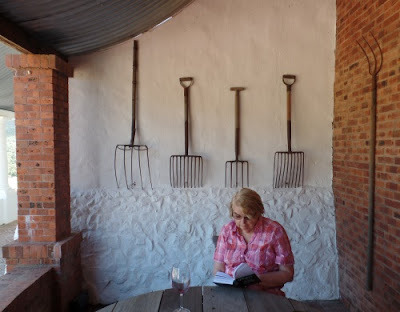 Somehow I'd visualised a modern commercial winery and maybe a grand Cape Dutch house but what we found at the end of the dirt road was a collection of – historic is the polite word – collection of single story farm buildings and hand painted signs. 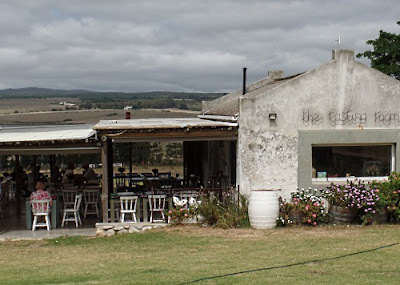 We parked under a tree next to a vineyard and walked down towards a cottage with a covered area outside with seating and several people eating. 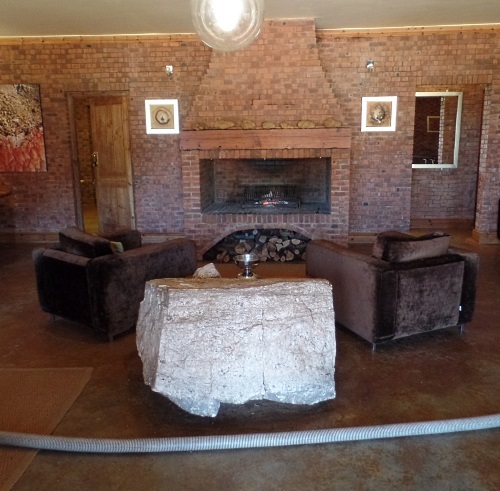 This was the Tasting Room and restaurant. We were greeted with a great big smile and warm friendly welcome to 'sit anywhere our heart desired'. The table was decorated with a pot of protea flowers. We heard they were grown on the farm and Veldfire Protea was one of the most popular and had been discovered on the property. A chalkboard on a wall listed hot dishes of the day, there were also platters of tapas and meats and cheeses with breads and chutneys. 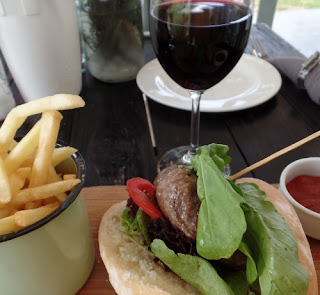 Jo had a salmon tart with a delicious looking salad and glass of Sauvignon blanc 2016 while I had a glass of Jacksons Pinotage 2014 and a Springbok Burger which came with a salad garnish and a tin cup filled with thin chips. Both meals were delicious, the venison tender, lean, sweet and flavoursome. 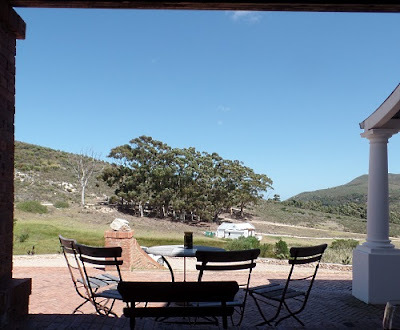 The views from the eating area are breath taking, with vineyards up to the foothills of mountains behind, and over a valley with, apart from a couple of dirt tracks, barely a sign of human habitation. 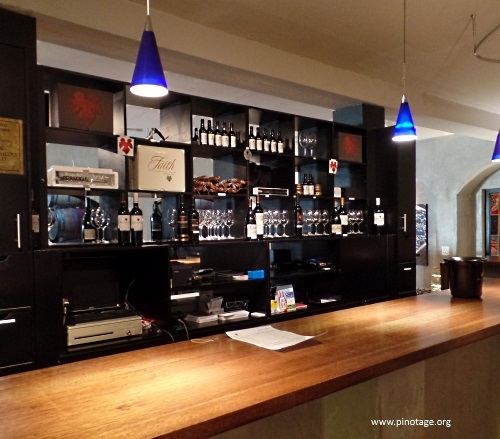 The tasting counter is at the entrance to the restaurant, but the cheerful lady in charge brought a glass of their second label Veldfire Pinotage 2014 and Veldfire Cape Blend (65% Shiraz/ 35% Pinotage) 2014 to our table for tasting after our meal. The Veldfire is made in stainless steel with oak stave wood treatment and closed with screwcaps. The Pinotage was pleasant but I thought the Shiraz overbalanced the Cape Blend. 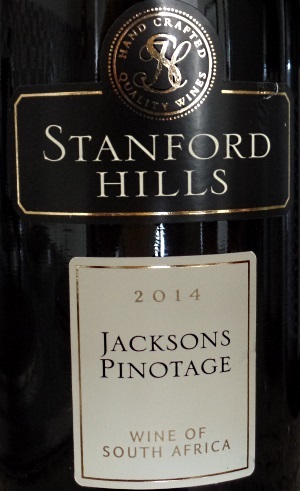 I bought a bottle of the super Stanford Hills Jacksons Pinotage 2014. Jacksons Pinotage 2014 spent 11 months in French and Hungarian oak barrels and came from the 4ha vineyard next to the restaurant, planted by Jackson, a previous owner. Altogether Stanford Hills have 12ha of vines planted on their 120ha property. It was a delightful place to lunch, pleasantly casual, very friendly with delicious food cooked to order, great views and lovely wines. We hope to return.